Sometimes certain music stirs the soul and arouses feelings deep inside that you had forgotten existed. YANNI VOICES, one of Yanni's newest collaborations fits into this category. With Yanni's sweeping melodies combined with the powerful and passionate vocals sung by four young singers Nathan Pacheco, Chloe, Ender Thomas and Leslie Mills, the music carries you high like a ride on an ocean wave. Today, April 10th, the group begins their whirlwind, worldwide Yanni Voices Tour. The YANNI VOICES CD/DVD gives me goose bumps just listening to it, so I imagine seeing the group in person would be amazing. The CD produced by Ric Wake and Yanni includes 17 tracks and a bonus behind the scenes DVD. I've always been a fan of Yanni's new age music and this CD takes it to a different level, incorporating other styles like opera and pop. The mixture of music (going from operatic to pop) causes a bit of disruption in the flow from one track to another, but the talents of the singers are what make this CD incredible. My favorites include the breathtaking beautiful "Unico Amore" and "Amare Di Nuovo" both powerfully sung by Nathan Pacheco, "Before the Night Ends" sung by Leslie Mills (sounds a bit Sarah McLachlanish), and the up-tempo Ritual De Amor (Desire) sung by Ender Thomas. I was also pleasantly surprised by the length and content of the DVD. The DVD includes lots of singing and features segments on each of the four vocalists as well as interviews with Yanni and Ric Wake. The CD/DVD combo makes this album a great value. 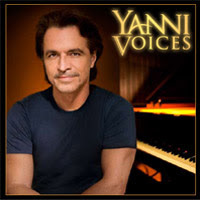 YANNI VOICES debuted at #20 on Billboard's Top 200 and #1 on the New Age chart on April 1st.